Hurme FIN Mono is a simplified monolinear and monospaced sans-serif. Horizontal stroke terminals. Short ascenders and descenders. Optically adjusted Obliques. Seven weights, in total 14 styles. 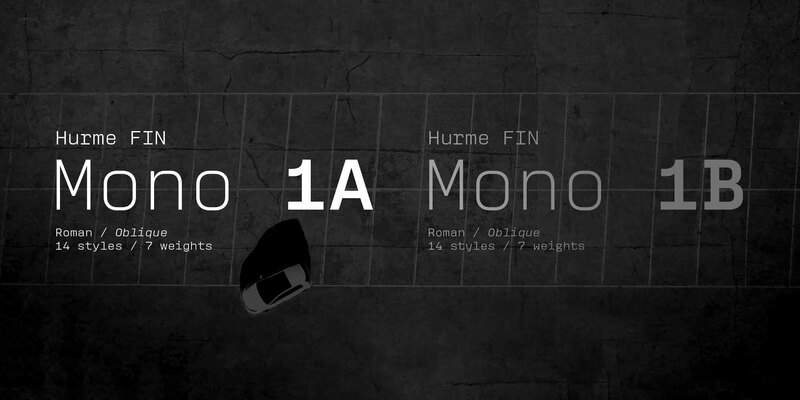 Hurme FIN Mono 1b is an alternative design of FIN Mono 1a. Hurme FIN Mono 1a and FIN Mono 1b are essentially the same fonts, but with different sets of characters set as default. In both family variants, all the other characters can be accessed through the Opentype features. When buying FIN Mono 1a, you will receive corresponding weights of FIN Mono 1b free of charge.